When it comes to pest control sprayers, some of our clients are skilled enough to buy the components from us and do the assembly themselves. We are happy to do this. It saves the client money and allows us to make a little money. Like anything else however, it is critical to know one's limitations. This photo shows a pest control spray rig that was assembled by the client. The client purchased the heavy duty steel reel lift from us. This component makes it easy to reach the hose reel to wind up the hose. The client not only improperly installed the lift (no washers under the bed), didn't paint the lift (rust) and ignored the problem. When the weight of the reel started bending the truck bed, he should have noticed and taken action (or asked for help). Eventually the bolts pulled through the bed. (See photo). 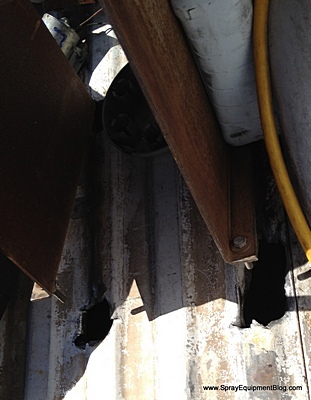 The client only came to us for help when his green garde spray gun fell through the hole and was destroyed. He came to us for a new gun (not to fix the real problem).